So, I make teeny tiny quiches, but I thought it was high time I started making some with proper pastry. 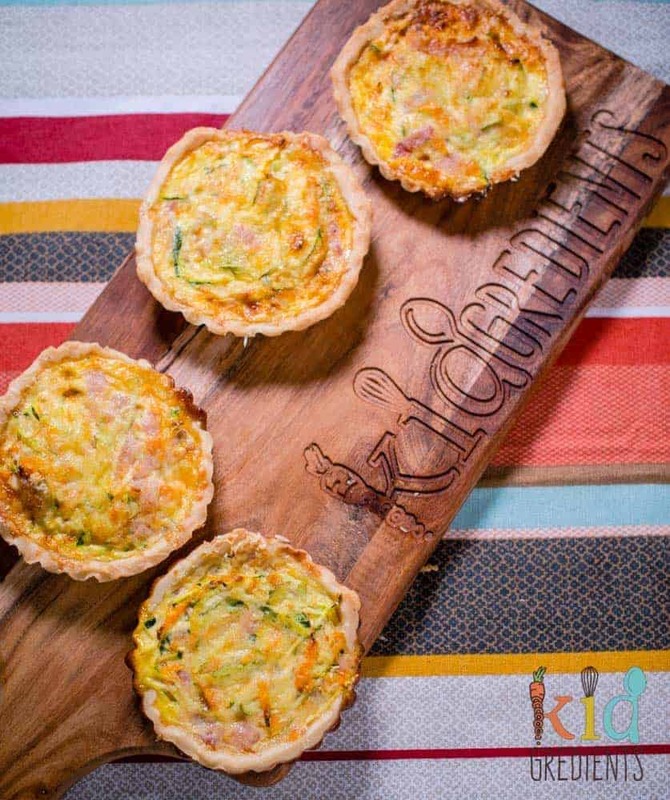 Miss 5 loves quiche and so does Master 3, but convincing Mister Kidgredients is a little harder…so I thought…why not make some lunchbox ones? 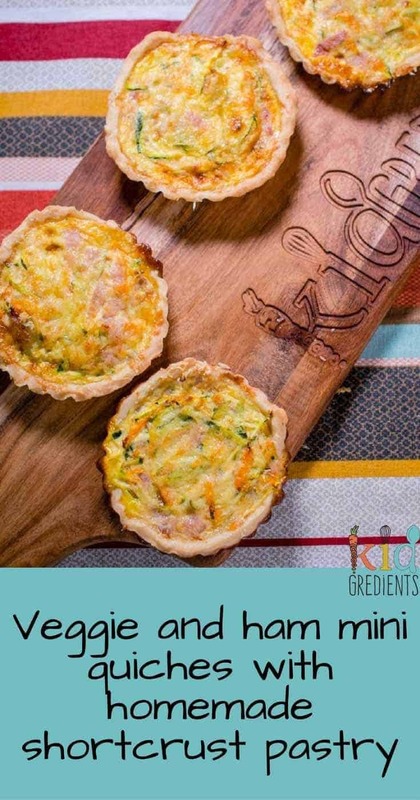 These veggie and ham mini quiches with homemade shortcrust pastry are perfect for the lunchbox. They fit perfectly in the yumbox panino which is a big advantage for us and they also are fine chopped and stacked in the original if you’re using one of those! 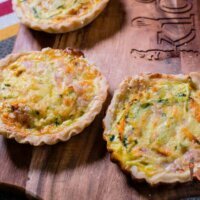 Why bother with lunchbox quiche? Well, they are high in protein thanks to the eggs, they freeze really well and they they are just extra extra yummy. So basically all the requirements for a lunchbox item are fulfilled. Plus, with this recipe making 6, you are set for more than one school week! Or if you’ve got more kids, double or even triple the recipe. They are a little fiddly to make, you need to blind bake the pastry, but if you’re not feeling like you want to do the pastry, just by the frozen ones (no blind bake needed) from the supermarket or buy the sheets of frozen shortcrust and cut to fit (but you’ll still have to blind bake those). Why bother with your own homemade shortcrust pastry? Well, it’s super simple and basically you know exactly what’s in it, so it is a great way to be sure you’re not getting anything unexpected in your food! If you want to make these vegetarian just omit the ham. To be honest, these are probably a little plain for an adult palate, I would prefer a bit of onion in them, so you can add that if you want too, but at the moment onion is very high on Miss 5’s “I won’t eat that radar!”. These are really versatile, use the veggies you’ve got, don’t stress about having exactly what I’ve got in these, that’s why they are called veggie and ham …choose your own veggie adventure! 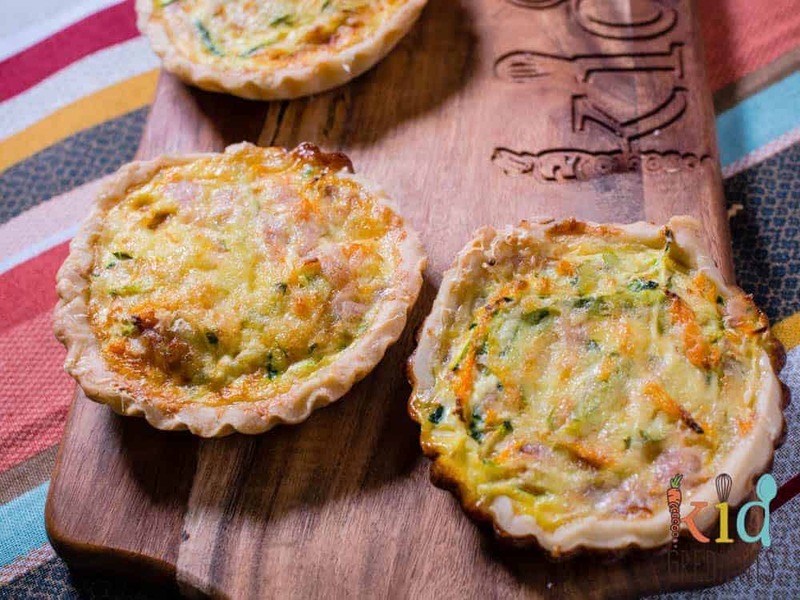 If you want other quiche filling inspiration…try this sweet potato, bacon and leek one. Veggie and ham mini quiches with homemade shortcrust pastry.Perfect for the lunchbox and freezer friendly. The most delicious protein hit for lunchtime! Add the butter and flour to the bowl of a food processor and process until it looks like bread crumbs. Pour the water gently into the top, watching until a pastry forms. You may not need all of the water. Roll out the pastry until .5mm thick. Cut the shapes required for your quiche/ flan tins. Push the pastry into your tins, blind bake (this means weighted with a piece of baking paper then either uncooked rice, dried beans or actual baking weights) for 15 minutes. Allow to cool for 5 minutes before filling. Mix the eggs, milk, ham and veggies together until well mixed. Fill the cooled bases with the mixture, then top with cheese. Cook for 15 minutes or until set. 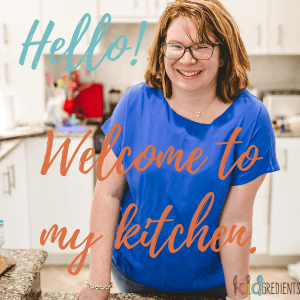 The total time on the recipe is 35 minutes- which reflects the 15 minutes blind bake, 5 minute ingredient prep and the 15 filled bake. With homemade pastry you want to make sure the pastry has a good seal (blind bake) before filling…or you get a soggy mess! How long do I cook the filling for? How do I cook the filling? Ooh I’m fixing this, sorry, there have been some little mishaps with the transfer to a new host, but all is being fixed! These look great! Mr 4 is also going through a phase of not wanting to eat a LOT of things and recipes like this are such a great way to sneak some good stuff into him! I know what you mean! I’ve been there with Master almost 4!